NWU591V seen at Roughham 'Wings, Wheels and Steel' in 2008. Added by Peter Williams on 15 January 2012. Peter, do you know if this was in service with this livery? It's a bit OTT with all the reflective stripes. Would look great with all that taken off and resprayed all red. Do you know where it was stationed and what it carried? Added by Matt Ireland on 16 January 2012. Added by Brett Clayton on 17 January 2012. 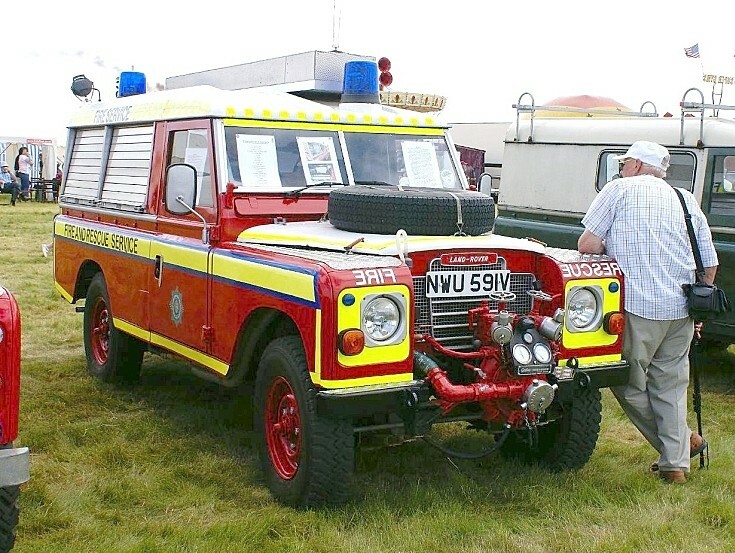 I do know that Peter Jarman accredits this one to West Yorkshire Fire Service, but it was certainly never on the appliance strength, so if it was with them, it was been purely as an ancillary vehicle, and certainly wouldn't be striped up as it is now. If memory serves me correctly - I said "if" - it served with a non-local authority brigade more recently. If you're reading this, Peter, your input would be welcome. Added by Ian Moore on 18 January 2012. This land rover was owned by a good firend of mine from 2007 to 2010. The following is the history that my friend had. First used in the militray as a mobile radio unit. In 1980 aquired by Farnham Hospital who converted it to first response unit. Kept until 1986 and moved to Brookwood Hospital Fire service then shorly sold on. Its history is then unclear until 1993 when it was purchased by a group in Manchester but was never used. It then made its way in about 2005/2005 to private ownership in Long Melford, suffolk. This is when I first saw the appliance and was well striped at that time.My friend purcahsed it in 2007 untill selling it on in 2010 to a land rover collector in south suffolk. Added by Graham on 18 January 2012. I cannot remember this being on West Yorkshires fleet. VF were used by LB Airport Fire Service once or twice around 1978. They short term leased an ex Humberside FT to us for a few months as we had several machines off the run for a while. I think the company name at the time was "Vehicle Finders", they also provided machines for film shoots for Yorkshire and Granada TV if memory serves me. Added by Firebum on 19 January 2012. Hi I was a retained fire man at Brookwood hospital in the mid 80's .The fire engine was used many times. It's nice to see her in such good condition. Added by Adam north on 20 July 2015. We owned this vehicle for a short while. It was with a private fore brigade in Essex serving those refineries down by the Thames. Then it was brought up to Manchester where we had it. Great little number, it was a 24v system so presumed it had come from the military as that is how they like their landrovers. Added by Matt on 29 October 2018. Simple and tidy conversion, with the neat and compact Coventry Climax Godiva 500 gpm pump and obviously an on board tank and hose reel. No crew seats, but you don't need them on an institutional first responder fire tender, because the staff are already on site! Added by on 06 November 2018.